About half of all workers on U.S. payrolls today are women. Moreover, the major- ity of mothers, whether married or single, work outside the home, meaning that in most American families, all of the adults work, and there is no full-time stay-at-home caregiver.This is not just a “women’s issue” since the changing nature of our families impacts men and women, adults and children. Indeed, as our population continues to rapidly age, more and more workers are finding themselves providing elder care to their aging parents as well. Here are the key facts you need to know about the wage gap and how it affects women. Women who work full time year round continue to earn only about 77 percent of what men earn. The gap between the median wage for a man and that of a woman in 2010 was a whopping $10,784 per year. That is enough money for the average woman to fund a year of higher education and a full year of health care costs, while still having more than $2,400 to contribute toward her retirement. The gender wage gap widens with age and accumulates over time. For young women at the beginning of their careers—between the ages of 25 to 29—the annual wage gap is about $1,700. But for women in the final five years of their careers before retirement, the wage gap grows to a whopping $14,352. Over a 40-year career, the average woman will lose $431,000 to the gender wage gap. That’s enough to buy two houses or pay for more than seven four-year college degrees. The gender wage gap exists for all women, regardless of race or ethnicity. White women earn 21.9 percent less than white men; black women earn 10.2 percent less than black men; Latinas earn 8.7 percent less than Latino men; and Asian American women earn 20.3 percent less than Asian American men. The wage gap is smaller for African American and Hispanic women primarily because wages for people of color tend to be lower overall. In spite of the fact that women are now earning the majority of college degrees, the wage gap persists. The American Association of University Women found that college-educated women start out earning 5 percent less than their male peers—even when they went to the same of schools, made the same grades, entered the same jobs, and made the same choices regarding marriage and children. After 10 years on the job, the wage gap widens to 12 percent—even when women have kept working at the same pace as their male peers. Single women face an even larger, on average, gender wage gap than married women. Single women typically earn less than married women—21.2 percent less. Moreover, they earn only 57 cents to the dollar, compared to married men. Part of the reason women earn less than men is related to the fact that they are more likely to work in so-called pink-collar jobs, which offer low wages. The top 10 occupations for women include secretaries and administrative assistants, cashiers, retail salespersons, and waitresses. These types of jobs tend to pay less than those in male-dominated industries and professions. Occupational segregation cannot explain away the gender wage gap. Only about a quarter of the wage gap is due to occupational differences, and about 10 percent of the gap is due to the fact that women are more likely than men to leave the paid labor force to provide family care. Even when controlling for occupation, experience, race, and union membership, 41 percent of the wage gap cannot be explained through measurable factors, indicating that part of the discrepancy is due to gender-based discrimination. The gender wage gap does not just hurt women—it impacts entire families, as well. Nearly two-thirds of mothers are either the breadwinner for their family or share that responsibility with a partner. Women’s earnings therefore are vital to their families’ economic well-being. When women earn less, their families suffer as a result. Legislation that would help narrow the wage gap has been stymied by Congress. 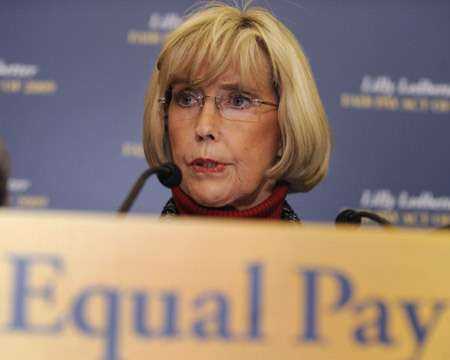 The Lilly Ledbetter Fair Pay Act—which helps women and minorities who have been discriminated against by restarting the clock on the statute of limitations with each discriminatory paycheck—was a step forward, but it fails to get to the root of the problem. The Paycheck Fairness Act, however, would empower women by outlawing workplace policies that make disclosing one’s salary to coworkers a cause for being fired and would provide negotiation training for women and girls. Inexcusably, it has yet to come up for a full vote in either the House or the Senate in this Congress. The bottom line: It is past time to remedy pay inequity between men and women.